— This article by Jerry Cates was first published on 23 October 2015, and revised last on 11 September 2016. © Budsinthenews Vol. 6:10(10). The lavenders (Lavandula spp.) comprise a genus of 25-30 species of flowering plants in the Lamiaceae (the mint family). All are native to the Mediterranean region southward to Africa and eastward to a number of regions in Asia. The genus includes annuals, herbs, and shrubs. 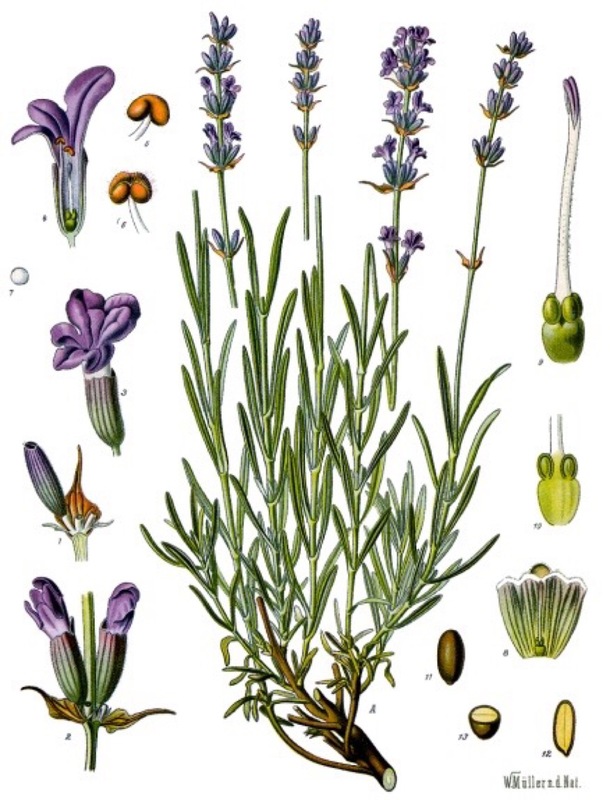 English lavender (Lavandula angustifolia) has been used for centuries as an herbal remedy. It yields an essential oil whose sweet overtones are favored in balms, salves, perfumes, cosmetics and other topical applications. In addition, the pure essential oil has been used internally to treat a variety of ailments, among them stress, anxiety, exhaustion, irritability, headaches (incl. migraines), insomnia, depression, colds, indigestion, flatulence, liver and gallbladder dysfunction, nervousness, loss of appetite. It is often used to freshen the breath as an additive to mouthwashes. In a 2010 study conducted by Hui et al., a total of 47 compounds could be identified from essential oils derived from lavender. Of these, the most prominent was linalyl butyrate (1,5-Dimethyl-1-vinyl-4-hexenyl butyrate), which constituted 42.73% of the oil. This was followed by ocimine (1,3,7-Octatriene,3,7-dimethyl), constituting 25.1%, then Eucalyptol (7.32%), and Camphor (3.79%). Linalyl butyrate, the most prominent chemical compound found in essential oil extracted from Lavandula angustifolia. This chemical is variously known as linalyl butyrate, butanoic acid, 1-ethenyl-1,5-dimethyl-4-hexenyl ester; butyric acid, linalyl ester, 1,5-dimethyl-1-vinyl-4-hexenyl ester, and linalyl butanoate. With such a long list of synonyms, one would expect interesting results from digging deeper into its persona. However, its fame appears to attach mostly if not wholly to its aromatic qualities, which are important, as they are soothing to the nose, but are otherwise comprised of somewhat ho-hum characteristics. The ocimenes are often found naturally as mixtures of the various forms. Ocimene mixtures, as well as pure ocimene compounds, are oils with pleasant fragrances, with insecticidal, nematicidal, and fungicidal properties that defend the plant against attack from insects, nematodes, and fungi. They are used in perfumery and, as is also the case with the related acyclic terpene myrcene, are unstable as aerial evaporative chemicals. As with other terpenes, ocimenes are soluble in common organic solvents, including ethanol, but are practically insoluble in pure water. They are named in honor of the plant genus Ocimum. As alluded to above, the ocimenes are comprised of several isomeric monoterpene hydrocarbons that differ both structurally and stereoscopically. α-Ocimene differs structurally from the β-ocimenes in the position of the isolated double bond, such that it is terminal in the alpha isomer. α-Ocimene is cis-3,7-dimethyl-1,3,7-octatriene. β-Ocimene is trans-3,7-dimethyl-1,3,6-octatriene. β-Ocimene exists in two stereoisomeric forms, cis and trans, with respect to the central double bond. The ocimenes are often found naturally as mixtures of the various forms. Domain: Eukaryota (yew-carr-ee-OH-tah) — from the Greek prefix ευ (yew) = good, well, pleasing + καρυον (khar-yone) = a nut/nucleus, thus organisms whose cells contain a nucleus and other organelles within membranes. (unranked): Bikonta Cavalier-Smith, 1993 (bye-KOHN-tuh) — from the Latin bis = twice/double + the Greek κοντος = a punting pole; those eukaryotic organisms within the subgroups Apusozoa, Rhizaria, Excavata, Archaeplastida, or Chromalveolata. (unranked): Archaeplastida Adl et al., 2005 (ahr-kee-PLASS-tih-duh) — from the Greek αρχαιος (AHR-kee-ose) = ancient/antiquated + πλασις (PLAS-iss) = a moulding + Anglo Saxon tid = time; a major group of eukaryotes, comprised of the red algae (Rhodophyta), the green algae, and the land plants along with the freshwater unicellular algae known as glaucophytes. Kingdom/Regnum: Plantae Copeland, 1956 (PLAN-tee) or Viridiplantae Cavalier-Smith, 1881 (veer-id-eye-PLAN-tee) — from the Latin planta = a green twig; the plant kingdom, consisting of multi-cellular green plants, i.e., whose cells have cellulose within their cell walls and have primary chloroplasts derived from endosymbiosis with cyanobacteria containing chlorophylls a and b and lack phycobilins..
(unranked): Streptophyta Jeffrey 1967 (strepp-toh-PHY-tuh) — from στρεπτος (STREP-tose) = (easily) twisted, pliant + φυτον (PHU-tawn) = a plant/tree; the land plants and the green algal group Charophyta. —Feel free to e-mail jerry.cates@entomobiotics.com regarding your comments on this article. You may also register, log in, and leave a detailed comment in the space provided below.